A 6-year-old child was killed and a male was injured Monday around 11:45 a.m. when Sri Lanka Army (SLA) fired artillery shells targeted Hudson Road (Ira'naimadu Vaddakkachchi Road), according to initial details from Tamileelam police officials in Vanni. 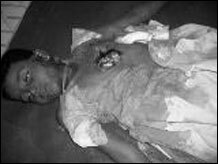 The killed girl was on her way back home from Vaddakkachchi school as the school closed earlier due to artillery barrage. 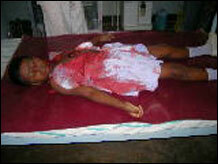 The slain girl was identified as Arulanandam Nirojini from No. 16 Hudson Road. The male wounded was identified as 30-year-old K. Vinayagavel. The artillery barrage targeting Hudson Road towards Ira'naimadu junction came after a Sri Lanka Air Force (SLAF) attacked Kanakapuram, a suburb of Ki'linochchi around 11:00 a.m. Artillery barrage lasted till 12:20 p.m.